Earlier this year, I had the privilege of taking a front row seat at New York Fashion Week. As I watched the stunning designs float down runway, I was struck by the bright and bold nail art on display from the likes of Marc Jacobs to the new kid on the block, Kerby Jean-Raymond. 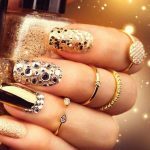 I came away with hundreds of new nail ideas to try out. After much deliberation, I finally narrowed it down to my three favorites. Want to know best part? You can easily recreate all of these looks in the comfort of your own home by using a quality manicure set. So let’s take a look at the biggest and the best spring/summer trends rocking the nail scene. Dust off your 80s neon’s and get ready to party with this fun trend spearheaded by the fabulous Essie designer, Miss Pop. Think techno and animal prints in vibrant colors that will give you plenty of street appeal. I love this look because it’s so easy to create, even for a beginner nail tech. Start with a clear base coat, taking care to cover the whole nail. Next select a color for your top coat. This season my picks are soft purple, fuschia and coral. Create an animalistic effect by painting half moons and dots using the tip of your brush. All done! I always say that if in doubt go for a classic French manicure. This chic style will make you look effortless and timeless. 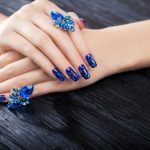 This year, some of the most coveted designers have revamped the pure French manicure to produce interesting styles that will have admirers flocking to take a closer look at your nails. The secret? Use bewildering color pairings in a clean traditional manicure. I recommend you try pistachio and plum that will make you look good in any season, or corals accented by a shimmering silver metallics for a summer shine. Be prepared! Achieving this look requires a steady hand so make sure you’re using a quality manicure table. This year is all about celebrating your female strength and empowerment. Movements like #TimesUp have spurred all of us to use our voice and stand up for ourselves. But you don’t have to wear black in solidarity to achieve this formidable effect. Instead, make your statement by painting 2 x coats of flawless watercolors and letting your nails grow ever so slightly long. This power look is all about beauty with an edge – just like you!